Google likes to make SEOs look like fools. Some are, but some are simply privy to less information. Or, in some cases, thrown under the bus by a new wave editorial policy in the gray area. Inconsistent enforcement is a major issue, but even if you go beyond that, the truth is most businesses have a range of revenue streams from pure as can be to entirely parasitic. Recently we saw Matt Cutts play investigative reporter & literally create a story about how dirty some of Bing's affiliates are. Here is the litmus test though: when Microsoft became aware of it they immediately canned the shady distribution partner. Meanwhile, Google still funds toolbars that put AdSense ads in them AND to this day Google still funds google.bearshare.com, which *is* driven by the same kinds of home page changes that Matt found distasteful. In Manufacturing Consent Noam Chomsky highlights that we should judge actions based on an equality of principals & that we are responsible primarily for our own actions. Yet Google complains about Microsoft. It took Microsoft less than a day to clean up their act, while Google still hasn't fixed issues that were highlighted publicly 6 years ago! an out of context tweet on cloaking: "Google will more at cloaking in Q1 2011. Not just page content matters; avoid different headers/redirects to Googlebot instead of users." Individually, each of those issues can be debated. In our new site design our navigation is aggressively repetitive in some areas. The reason we did that was some people complained about not being able to effectively get around the site. To help make the navigation more intuitive and consistent we use drop downs and in some cases have 3 or 4 or even 5 links to the same location. Is that optimal from a search perspective? Probably not. But then again, search engines don't convert into paying customers. They are simply a conduit...a means to an end. When an engineer views a site they might not view it through the same lens as a customer would. What is an unnatural link profile? Does it depend on who is building the links? We know that at an SEO conference when some of IAC's cross linking was highlighted Matt Cutts stated "those don't count" but didn't qualify it any further. Likewise when it was highlighted how Mahalo was link farming we were told that they deserved the benefit of the doubt. Since then the link farms have grown and mutated. 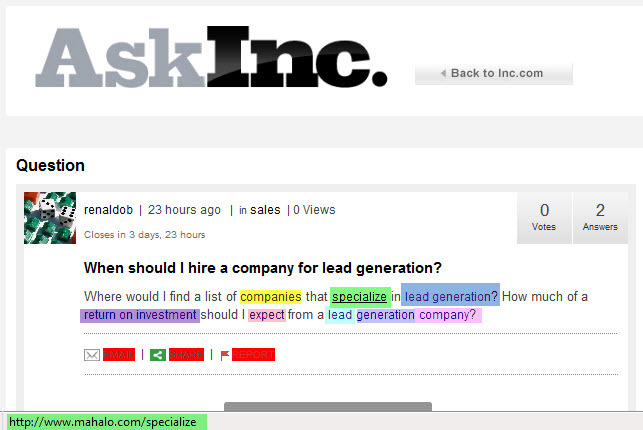 I won't link at ask.inc.com/when-should-i-hire-a-company-for-lead-generation, but if I was told that the following is "natural" and "good to go" then I would have no problems building a few million links a week. Then again, I bet it would be "unnatural" if I did the same thing. The part about treating Googlebot different from users is a bit perplexing. As technology has evolved this area has become quite blurry/murky. Sometimes when clicking into big media sites that are 'first click free' I get kicked right to a registration page. In the past some iTunes pages would rank & force you into the iTunes software (though that may have recently changed). 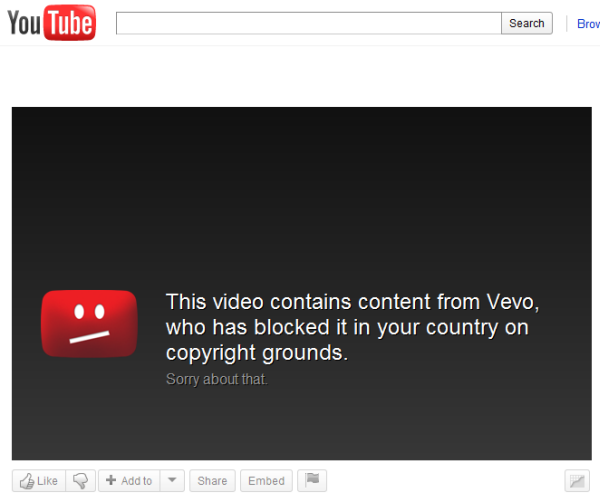 Google ranks certain Youtube content in international markets, even where said content is unavailable. Scroll cloaking has been around forever. Tools like Google Website Optimizer can be used to alter user experience significantly. There is an SEO start up which pushes search visitors to sites like CNN to a heavily ad wrapped & paginated version of the same content. I accidentally screwed up using a rel=canonical on a page (cut the source code from a dynamic page and pasted it as the basis for a similar static page & forgot to remove the rel=canonical tag). Eventually I figured out what was wrong & fixed it, but both the correct and incorrect pages ranked for weeks at #1 and #2. And isn't the whole point of the rel=canonical tag to give the search engines a different type of header than an end user (telling the search engine that the content is elsewhere while telling the user nothing of the sort)? Spam is in the eye of the beholder, as is relevancy. The thing is, Google is in a position to imply intent as they see fit. They are in a position to tilt the playing table as they see fit. They claim to be open and sometimes they are fighting the good fight, but businesses have a range of revenue streams from pure as can be to entirely parasitic. 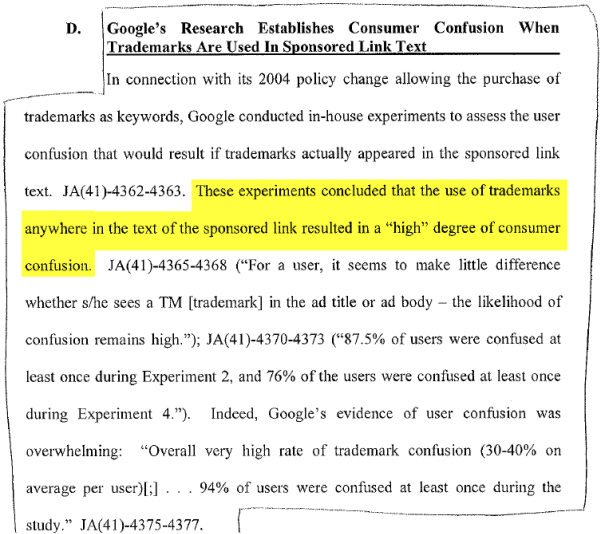 The leaked internal Google documents about copyright and ads on trademarks certainly highlight that Google has no problem with a foot in each pond. Syndication has long been a part of the media landscape, where portals chose what bits to mix in from where. But how much is fine & what should be done with duplicates? 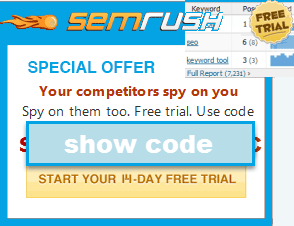 When does something go from 'legitimate syndication' to 'overt spam'? We see official Google blog posts which claim that AdSense ads are not allowed on unoriginal content, while Google has multiple large partners that wrap Google's search results in the AdSense feed and then serve it back to Google. Site categories which were described as 'shoot on sight' become viable enterprises when a person puts a web 2.0 design, venture capital & some public relations into the same basic business model. If Google is going to put out some 'thou shalt not' styled commandments under the label of 'fact vs fiction' they should have consistent enforcement of obvious issues that have been brought up publicly numerous times, including on the very post highlighting the policy. But we know they won't! They only care about dirty business practices if they are not getting a taste of the revenue stream (as shown by their BearShare partnership while policing Bing affiliates). Based on that sort of activity, when Google announces a preference while promoting "openness" it is easy to see it as a step backward, hypocritical, or even as a farce. Embrace, extend, extinguish. 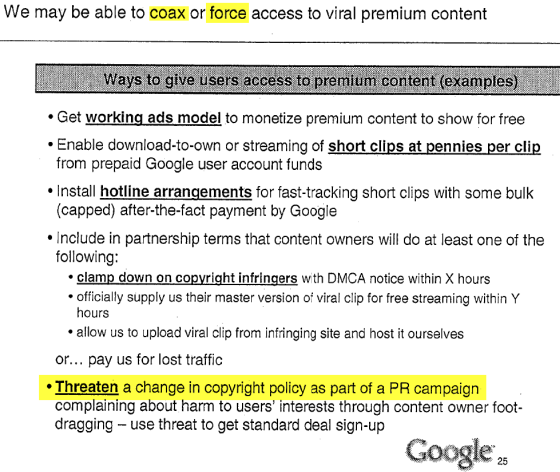 As Google pushes more to advertise itself on its ad network it is no surprise that they were eventually forced to disclose payout percentages. But it took a lawsuit to do it. After purchasing Youtube Google rolled out their universal search & was fine with aggressively promoting Youtube over other video services. Only recent government reviews have pushed Google to give 3rd party services a fair shake, but the network effects and lead are likely already too great to overcome. Due to past search bias, Google might get blocked out of completing the ITA deal. The good news going forward for publishers is due to increasing regulatory heat Google will only go after a small number of verticals where they payouts are huge. The regulatory blowback will be too great for them to try to be all things to all people. When Google's head spam fighter is doing public relations AND the Washington Post covers his lobbying you know Google is nearing a breaking point. You don't happen to know if there is a publicly available copy of Matt Cutts "89-page slide presentation called 'Search Integrity'" that he used when lobbying the FTC by any chance, do you? I would love to be able to see what he fed them. I am really looking to get that document as well ... but so far have found nothing. About a week ago SEL stated they are trying to get a copy of it, but I haven't seen a follow up yet. Is this something that can be obtained through the FOIA? In any event, there is a reason why Google has gotten so cozy with politicians over the last few years. The DOJ, FCC, and other agencies have a lot of control over their future. They have gotten so large and control so much of the web's ad space that it's becoming near impossible to survive online without them in some industries. Noam Chomsky, this is just a broad claim, asserts the various contradictions, unethical actions, and disasters of Government (in addition to being a brilliant linguist, of course..... However, when it comes to providing solutions to many of these issues (to which the very last chapter of of his books are dedicated to, he just...runs out of stream).